Last year, I had the absolute pleasure of watching Deepak Sharma direct an episode of Na Bole Tum Na Maine Kuch Kaha - Season 1. The scene was supposed to be short but intense. On paper, the scene was about half a page long, when the episode aired, what we saw on television was about 5 minutes long. For Deepak and his team the exact same scene took about 3 hours to shoot! 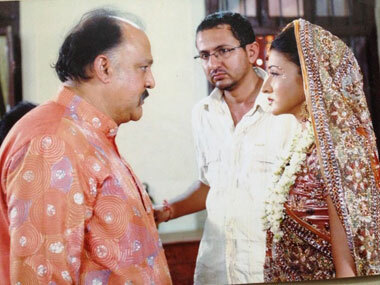 The scene involved Mohan and Megha, dialogues, intense emotions, love, heartbreak, longing, confrontation, defeat, acceptance, denial, eye locks, the unspoken words and a mangalsutra…and it was Deepak’s job to ensure that we, the viewers got to see and experience each and every facet mentioned above in those 5 minutes. I watched him rehearse with the actors, explain the nuances, depths and layers he wanted in the scene, scold one of his unit members for having his cell phone on during the shoot, laugh with the actors when they committed a blooper, ensure that someone got a cup of tea for me, wait patiently for things to get set up and shoot the scene over and over till he got exactly what he was looking for! And you thought a director just sat behind a monitor and yelled ‘ACTION’ and ‘CUT’! 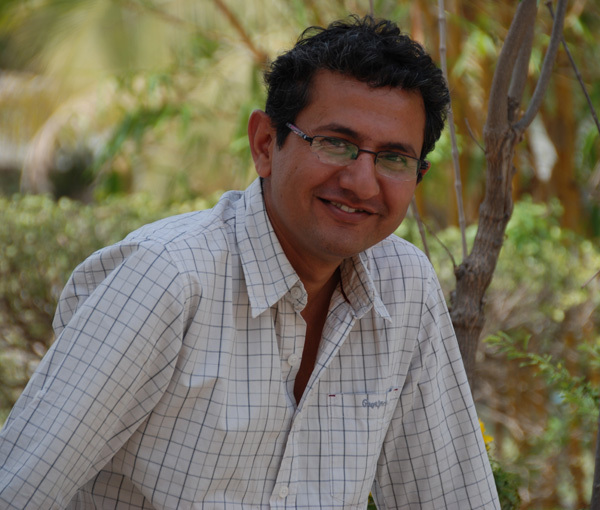 Deepak Sharma is one of the most eminent directors in the Indian television industry today who has accrued the reputation for visual flair and thoughtful cinematography. He has worked with some of the most well established actors and been a part of epic shows such as Kyunki, Kumkum, Kasamh Se, Ranbir Rano, Yahaa Mein Ghar Ghar Kheli and Na Bole Tum (Season 1) just to name a few. 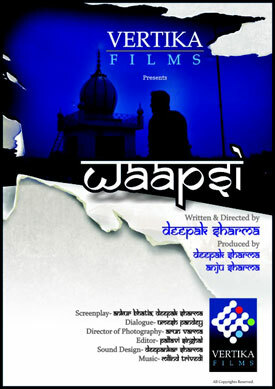 Recently Deepak wrote and directed ‘Waapasi’ a short Punjabi film that received a nomination in the 3rd Dada Saheb Phalke Awards Film Festival, 2013. 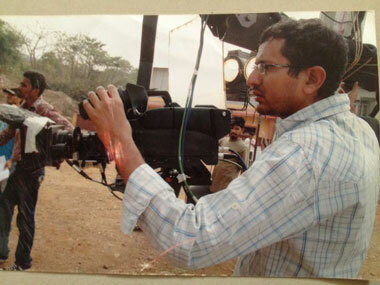 Armed with a technical mind and creative eye, Deepak Sharma shares his directorial journey with Tinsel Gupshup. TG: Please tell us a bit about your background…how did you become interested in direction? DS: Actually, I never thought of becoming a Director. Being a commerce graduate, initially my aim was to become an accountant or to do a management course. However, during 1996 I took up theatre as a hobby and it gradually became an essential part of my life. I started taking theatre very seriously and soon I left everything else just so that I could completely focus on my new found passion. I feel that my career actually really started in 1996 when I joined Sri Ram Centre for Performing Art & Culture and during those years, I worked very hard as a theatre worker in Delhi. Unfortunately, even though theatre can give you creative satisfaction, one cannot survive in a city like Delhi on theatre work alone. So, apart from working as a theatre coordinator with a NGO called ‘Katha’, I also worked as an announcer on the National channel of All India Radio. In 2002, I received a two year Junior Fellowship for Punjabi Folk theatre (NAQQAL) from the ministry of Tourism & Culture, Department of Culture. I decided to relocate to Mumbai during 2004. 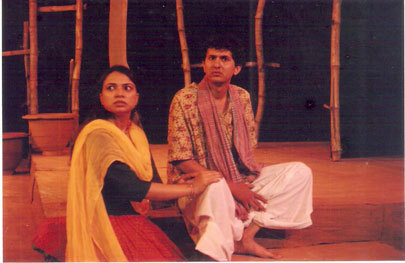 Once I was in Mumbai, it was only a matter of time before I decided to take up direction because while doing theatre I used to work as a light designer, take care of stage management and direct. TG: Directing a daily show is very different from directing a movie. Most of the times, the initial episodes are set up by one director, then another director takes on etc. Every director has an individual style of working so when you take over a show, what challenges do you face? DS: I think the difference in a daily show and a movie is the CANVAS. In a movie, you work on a bigger CANVAS as compared to television shows. However, now-a-days television shows are as grand as films. Yes, it’s an ongoing trend that one director sets up the initial episodes and then another director takes on. As far as style is concerned, some directors give importance to the technical aspects, while some give more weight to the storytelling and content part. When I take up a show, most of the times, the show is going through the phase of a bottleneck. So I face a lot of situations wherein we have to shoot for the telecast the very next day or the show has a bank of merely 1-2 episodes. The main challenge of taking up a show is to ensure that the product has both, quality in terms of the entertainment expected from the show and quantity in terms of bank episodes. Also, you have to understand that when a show starts, it is setup by one team for a few months and so the cast and crew are already familiar with each other and suddenly you land there as the so called ‘Captain of the Ship!’ So breaking the ice with the cast and crew is one of the biggest challenges faced by a director who takes on a show that has already been setup. However, overall each show I have worked on has been fun. With each show, I get an opportunity to take up the challenge and prove myself. TG: Out of all the shows you have directed, can you tell us about one that has given you the most creative satisfaction? DS: I love what I do so I have enjoyed each and every project that I have worked on to date. Apart from that I have also learnt so much from the variety of shows that I have worked on. However, in terms of creative satisfaction, I enjoyed doing CHAND KE PAAR CHALO that was aired on NDTV IMAGINE and NA BOLE TUM NA MAINE KUCH KAHA – Season 1 on COLORS. NBTNMKK-1 was a fantastic experience and it was almost like doing theatre all over again. So that show gave me the same kind of satisfaction I got while I was doing theatre. Each and every moment of NBTNMKK-1 was a fulfilling experience…taking care of the intricate nuances, discussing scenes and characters, rehearsals etc. It was a pleasure working with all the actors on the show because they are all such excellent performers. TG: I was on the set of NBTNMKK - Season 1 and got to see you directing a scene. Before the shoot, I noticed that you really got involved in rehearsing the scene with your actors. Is that an important part of the direction process for you? How do you rehearse your actors? Do you have to enact the scene for them or do you let them take over completely? DS: Coming from a background in theatre, rehearsals are a pivotal part for me. Each scene has to be perfect for me and I won’t accept anything less than that. After doing theatre for so long, seeking perfection is in the blood. For me, Sub-text is more important than the text. Well, I don’t enact scenes for my actors as I believe that if an actor is sincere enough he/she can give the best out of his/her life experiences. I can’t really let them take over completely but I am always open to suggestions. Do you know how the term ‘Director’ came into existence? A group of people having different opinions and interpretations decided to appoint one person in charge. This one person would see things objectively and was termed ‘Director’. A Director tries to present the best possible interpretation of a scene in a larger context. Unfortunately, these days in the television landscape, a Director’s point of view is given very little credence. TG: Over the years you have directed some brilliant actors and actresses. Can you tell us about a few people who have impressed you and also people who you have learnt from? DS: I have been fortunate to have worked on some of the best shows aired on Indian television which in turn has given me the opportunity to work with some excellent as well as senior artists such as Pawan Malhotra, Alok Nath, Arun Bali, Smriti Irani, Ronit Roy, Ram Kapoor, S. M. Zahir, Rajindra Gupta, Deep Dhillon, Pankaj Berry, Aanjjan Srivastav just to name a few. These senior artists have taught me to put honest efforts towards the content of the show. A good actor is not bigger than the character and these senior artists consider their character to be bigger than the actor! TG: Do you remember your first day as a director? Can you tell us a bit about the show and that first day experience? DS: Yes! I do remember my first day as director. It was on the sets of Kaisa Yeh Pyaar Hai for Sony TV and the sequence was a cricket match of small kids. There were 10-15 kids all between the ages of 6 to 10. It felt as if I was babysitting them all day but luckily it turned out well at the end. TG: On each show that you direct, you have to deal with different kinds of actors. For example, in NBT you had Kunal who has worked in shows before, Aakanksha had done theatre, Anjjan Srivastav is a senior artist who has worked in all facets of the industry, Ashnoor – an experienced child artist etc. Is it easier to direct an experienced actor or is it easier to mould a completely raw actor. DS: Sincerity impresses me more than experience. If an actor is very experienced but not sincere, that’s a waste for me. On the other hand, even if there is someone, who is new or less experienced but is sincere towards their work, I enjoy working with them. I don’t force my opinions on an actor about a given character or situation instead, I would much rather discuss things with them and that always turns out well for the show. TG: You have been in the industry for a while now. As a professional who has both technical and creative expertise, what would you like to see change in the way daily serials are made and also in the industry? TG: How do you choose your projects? DS: Unfortunately with the current scenario of the television industry…it is the other way around! Here, when a show is in a crisis, projects choose the director! So in such cases directors receive calls from the producer of the show. 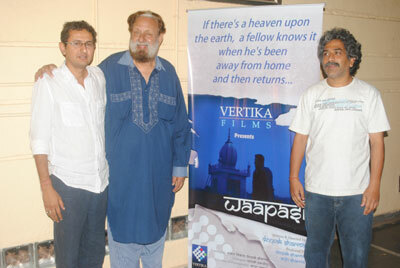 TG: You have directed a Punjabi short film – Waapasi. Can you tell us a bit about it? Was it your story and conceptualization? Why did you choose to do a Punjabi film? DS: About 2 years back I had to take a forced vacation because I did not have any shows to direct. During that time I penned down a short story called ‘Waapasi’ for a Punjabi short film. The story is based on how absence or distance affects relationships, and I was looking for a producer to finance it. Fortunately a friend was keen to produce it however his business partner did not find any ‘Wow’ factor in my story! I took his criticism very seriously and for about one and a half years, I got busy trying to find that ‘Wow’ factor in my short film. So basically, there I was…ready with the story, the screenplay and the dialogues but with no ‘Wow’ factor in any of it! Later in 2012, I visited Punjab for location hunting. I went alone because I could not afford to have a production team accompany me. I was visiting my hometown after almost 6-7 years! Travelling on a Punjab Roadway Bus, interacting with all sorts of people during my journey, I kept thinking about my story. It was during those travels, I realized that the USP to my story is its simplicity! I felt that a very simple narrative and realistic approach for my film would do justice to the subject. It hit me that I don’t need a ‘Wow’ factor for my film and I felt proud to stick with the original story! My gut instinct paid off because the short film did very well during the initial screenings and Waapasi got nominated for the 3rd Dada Saheb Phalke Film Festival 2013. As far as language of the film is concerned, being a Punjabi, the language comes naturally to me. Hence, I thought that I could do complete justice with the subject only if I made the film in Punjabi. TG: in daily serials, you direct regular day to day scenes and then you have larger scenes like celebrations, weddings, sangeets etc. I remember you were directing the whole sangeet / wedding sequence for Mohan and Megha…what is it like to work on such large sequences…it’s almost similar to doing a movie shoot…? 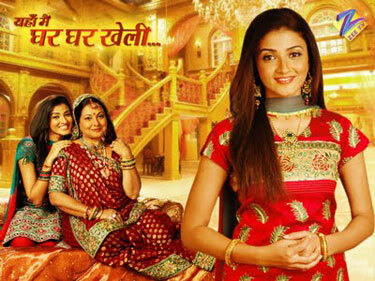 DS: Somewhere along the line, television serials depict the routine life of the characters in the show. Just like a usual common man, our characters in television shows, lead a day-to-day life and that’s one of the aspects that make our audiences feel connected with these characters. Hence, our characters too have celebrations and weddings as a part of their lives in the show. Such scenes are fun and as I mentioned earlier, now days there really is not much difference in the canvas of a film or a television show. So grand events on a television show does give you a feeling of shooting a film! However, the difference lies in the detailing part. Films have an approximate duration of 2 hours and 15 minutes so marriages or any such celebratory scenes are covered in the form of a 3-4 minute song or sometimes through the means of a few scenes. However, in television shows, such celebration may even exceed the span of 5-6 episodes. Hence, more detailing is required here. 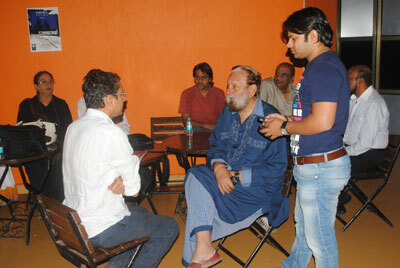 He sure is an intense director, his direction in NBT was outstanding. We rave and rant abt certain things and forget to give credit to those who delivered us the package!! Kudos & congrats! !